Can The Real Estate Industry Use Text Messaging? Text messaging applied to the real estate market is one of the fastest growing applications of mobile marketing. There are many advantages for the broker and the potential buyer. A common method for agents and brokers to find potential buyers is to place signs in the yards of their properties for sale. The sign has their phone number, and in many cases, a box of flyers with detailed information about the property. With the advent of cell phones, at least buyers can call the phone number while looking at the property. But that requires a knowledgeable person to answer the phone, and a conversation that hopefully will lead to an appointment. Nothing wrong with that, but many people may not be ready to talk to someone. They're just browsing at this point, so they take a flyer - if there are any flyers left. As a broker, you have no idea who takes the flyers, or if a mischievous kid makes paper airplanes out of them. All you know is that it's an ongoing expense - both in printing costs, and time spent refilling the boxes. 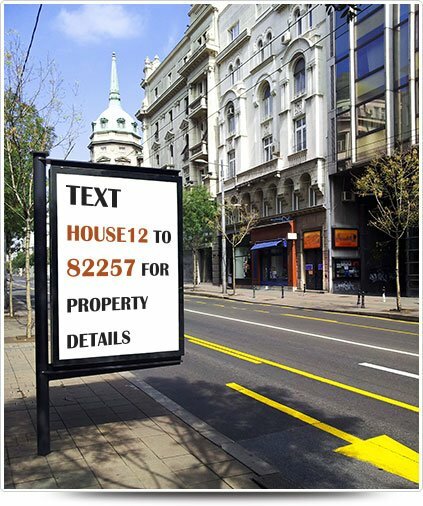 By adding a short message to the signs, "Text HOUSE12 to 63566 For Property Details", buyers can instantly receive details pertaining to that property on their mobile phones. And the seller has just captured their phone number for a follow up call. What if there was a way to know who took each flyer and how to contact them for a follow up conversation? Text messaging can not only supply that information, but it can also eliminate the costs associated with the flyers all together. Now that the buyer's information has been captured, a lot of options have suddenly become available. Entire groups of contacts can be sent property updates, new listing alerts, reduced prices, and open house notifications. Since each property requires a unique keyword in order to provide the correct information, the captured phone numbers will instantly be automatically grouped according to location and price. That way any future messages can be tailored to their particular desires. Also, by studying the information in the leads database, agents can learn things that can be very beneficial to their marketing efforts. For example, upon seeing what time of day the most inquiries arrive. it may become apparent that that's when the most people have free time, and it may be a better time to hold open houses than when they're being held now. We've just touched the surface in this article concerning all the ways real estate professionals can benefit from a text messaging service. Text messaging is an extremely effective tool, and in this competitive industry, it can help your business stand out among the competition.